… Our entire collection of Julie Hyzy books that is! After an outstandingly fun time with author Julie Hyzy at our April meeting, every single copy of all her books — in both series — was checked out! It was just one indicator of the fun we had talking to her about her White House Chef, Olivia (Ollie) Paras and her first adventure in The State of the Onion. The group enjoyed getting Julie’s inside take on not only the White House kitchen, but other areas of the White House that Julie uses in other books in the series. All members agreed that it was refreshing to have a cozy mystery open with a high action scene, and that the pace of the whole novel was an engaging fast read. And how can you not love an opening where an assistant chef plausibly brings down a trespasser with a frying pan? We asked whether she felt that Ollie was going to be limited in what she can do as an amateur sleuth — both by the demands of the job and that she’s pretty well tied to the kitchen. Julie agreed that it is a challenge to work with, but that she (and Ollie!) find ways to justify her involvement in each story’s crime. Overall, the group found State of the Onion to be a highly enjoyable introduction to both a series they plan to follow and that after meeting Julie, they are also intrigued about her other current series featuring historical mansion curator, Grace Wheaton. The first book in that series is Grace Under Pressure, and the third book, Grace Among Thieves is due out in June. Ollie’s latest exploits came out in book #5: Affairs of Steak. The library has it, and our copy of Grace Under Pressure is on order! We also want to thank the intrepid Sue Peterson from Brain Snacks for providing books from both of Julie’s series for Julie to sign for attendees. Members please add your comments about the book and the meeting! FYI: The Author Docket for Julie has been started under the Author Docket tab. More pictures from the meeting will be published there shortly. Yes, I’m talking about all of you— the current members of our mystery group! This is a chance to encourage others to join us and hear about the great books and good times we have with each other. If you have a friend who has been wondering about the group — bring them with you! If you want to see more of our brand-new blog in action — come see me! We will be up in the Meeting Room(s) from 10:00 a.m. — 2:00 p.m.this Saturday, April 14th. There will be treats available as well. To learn more about this, click here–> to go to the nice write up that was in the Lisle Patch last Tuesday. Tis the Season — for the Edgar and Agatha Awards! Both the Mystery Writers of America and the attendees at the upcoming Malice Dometic convention in D.C. will shortly be picking the winners from this year’s nominees for the Edgars and the Agathas, respectively. Here are links to the sites where these nominees are listed. 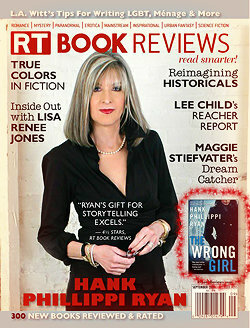 There’ll be another post shortly with links for the nominated mysteries that Lisle Library has. For this year’s celebration of National Library Week the theme is “You belong @ your library” — and Murder Among Friends is participating in a big way. This coming Saturday — from 10:00 a.m. – 2:00 p.m. –all of the groups that meet at the library will have representatives in the Meeting Room to share their enthusiasm for their particular group with all library patrons. Patti will be at the table for all of Lisle Library’s discussion groups — which naturally includes Murder Among Friends! We’ll have a special giveaway along with our bookmark for those who promise to make at least one of our meetings this year. 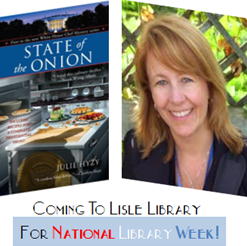 Our special contribution to National Library Week will be sharing our visit with Julie Hyzy with all interested Lisle Library patrons. Click on the graphic below to see the nice article we’ve had on this in the TribLocal!